Blue Poppy's momos are a thing to reckon with when it comes to momos in Kolkata. But meat lovers know the meal is never over without their fingerlicking chilly pork. On hearing about our deep love for the dish, owner Doma Wang and her daughter Sachiko offered to decode this dish from scratch for us - right from where to pick up ingredients to plating the dish. A key ingredient of the dish, fresh meat is an everyday staple at Blue Poppy and Doma is particularly insistent about the freshness and quality of meat. And there's just one place that she picks her meats from - in Tiretti Bazar or our old Chinatown. When in Tiretti Bazar, head towards its end and enter the narrow lane that lies perpendicularly opposite to it. Walk a few spaces and you'll come to Joy's nameless meat shop that's packed with all kinds of fresh pork meat cuts - from ribs, trotter, belly, back and even popular Chinese lapchong sausages. Prices keep varying. Next, up we followed Doma and Sachiko to their regular green and roots vendor in Tiretti Bazar. Sitting towards the end of the market with his paraphernalia of veggies, Ganesh Hazra is Doma's go-to veggie vendor for pak choi, celery and everything in-between. Doma picked up a bunch of fresh greens for her kitchen though it was only the spring onions and bell peppers that will be used for the chilly pork dish. 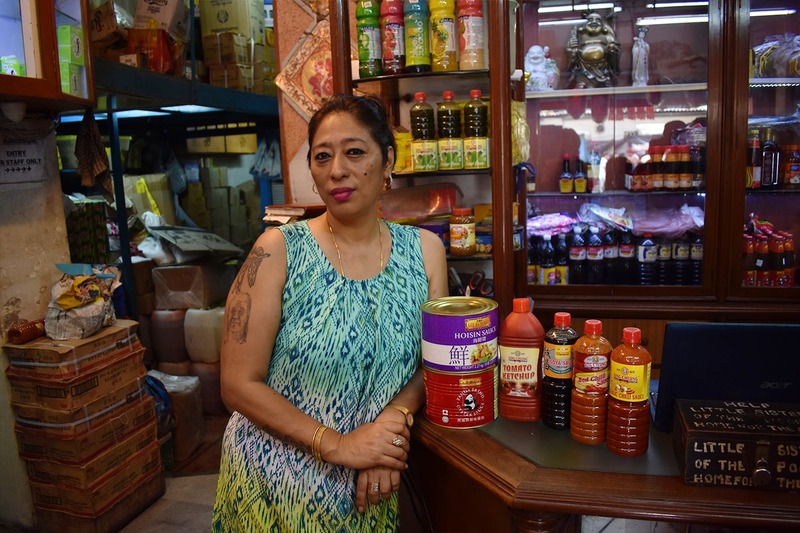 While on ingredient shopping, Doma told us of the pivotal role sauces play in flavouring Tibetan and other Cantonese dishes. She swears by Sing Cheung for some really great ones. She took us to the Sing Cheung store (walk down a few yards from Tiretti towards Central metro station) that was lined with sauces, noodles, several condiments and bamboo steamers. Doma picked up dark soya sauce and star anise for the dish from here and hoisin and others for her kitchen. Tasty and delicious, who knew chilly pork could be done in such a simple way! Sachiko decodes it by bringing together garlic, ginger, chilly paste, onions, capsicums, spring onions and boiled meat (boiled with star anise) in her pan and flavouring it with dark soya sauce. Following Doma and Sachiko's trail if you do visit India's oldest Chinatown, Tiretti, then do come here in the morning for a sumptuous Cantonese brekkie treat - you've got to try Bobby's meatball soup! And do visit the Chinese temples in the area.